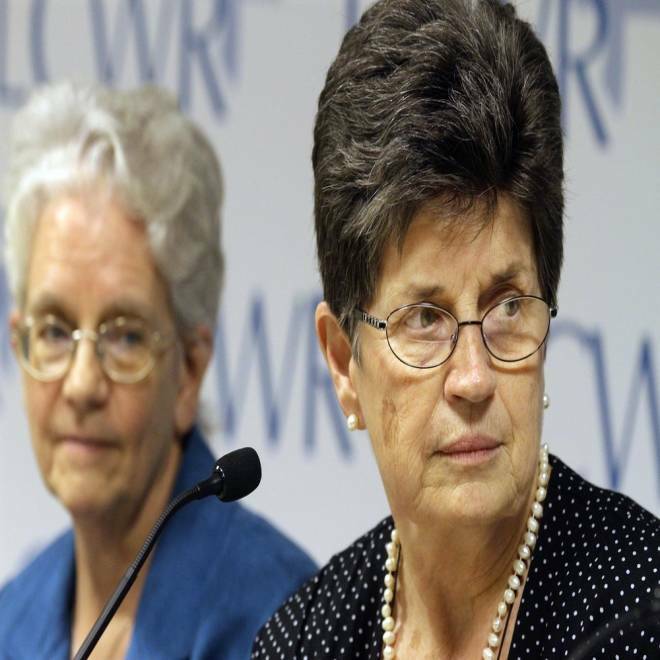 Outgoing President of The Leadership Conference of Women Religious Sister Pat Farrell, right, and president-elect Sister Florence Deacon, left, listen to questions from reporters Friday in St. Louis. American nuns under fire from the Vatican said they will continue their dialogue with Catholic bishops "for as long as possible," the group announced Friday as it wrapped a week of discussions and prayer at its yearly national assembly in St. Louis, Mo. According to the National Catholic Reporter, the Leadership Conference of Women Religious, an umbrella organization representing about 80 percent of the 57,000 nuns in the United States, "will reconsider if [they are] forced to compromise the integrity of [their] mission." Hours before the scheduled press conference, the organization's president addressed its members, urging the sisters to be “truthful, but gentle and absolutely fearless," according to the National Catholic Reporter. 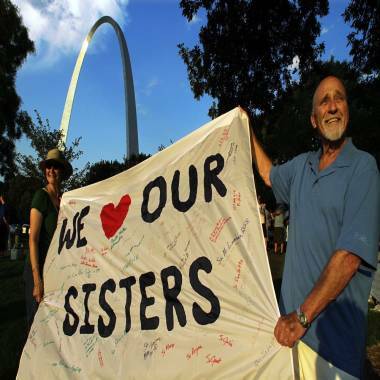 Joe Koerner and his wife, Maria Allen Koerner, of St. Louis, rally with other supporters of The Leadership Conference of Women Religious (LCWR) at a vigil Thursday in St. Louis. This spring, after a three-year investigation, the Vatican's doctrinal watchdog issued a report questioning the organization's loyalty to some Church teachings, including the nuns' lack of outspokenness on issues such as gay marriage, abortion and contraception. Another concern voiced by the Vatican related to nuns' conferences featuring "a prevalence of certain radical feminist themes incompatible with the Catholic faith." On April 18, the Vatican appointed Archbishop J. Peter Sartain of Seattle to oversee the nuns' organization and reform its programs to adhere more closely to "the teachings and discipline of the Church." This week, about 900 Catholic sisters discussed a range of responses to the criticism, from accepting the Vatican's mandate to starting a new organization independent of the church's control. In a Thursday interview with EWTN, a Catholic television network, Cardinal Raymond Burke, prefect of the Vatican’s Apostolic Signatura, warned that the Leadership Conference could be shut down if it rejects the Vatican's mandate for reform. “If it can’t be reformed, then it doesn’t have a right to continue,” Burke said, according to LifeSiteNews.com. “How in the world can these consecrated religious who have professed to follow Christ more closely … be opposed to what the Vicar of Christ is asking? This is a contradiction,” he added.